Assorted fruit from forty years' writing, these essays by David Braybrooke discuss (in Part One of the book) a variety of concrete, practical topics that ethical concerns bring into politics: people's interests; their needs as well as their preferences; their work and their commitment to work; their participation in politics and in other group activities. Essays follow on the justice with which theme matters are arranged for and on the common good in which they are consolidated. Justice here inspires a 'departures' approach, which moves from agreement on departures from commutative justice to agreement on measures of distributive justice needed to forestall such departures. Another essay (first published here) radically undermines the odd but entrenched belief that utilitarianism classically licenced, even prescribed, systematically sacrificing the happiness of some people to give others greater pleasure. 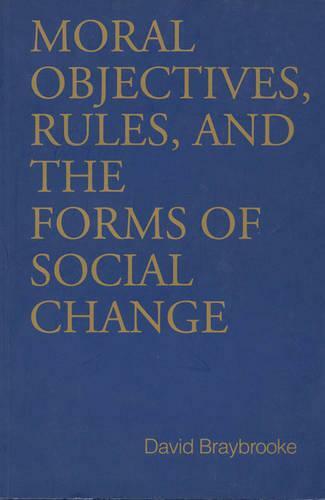 Part II and Part III of the book concentrate upon the subject of settled social rules, which are devices for securing the objectives treated in Part I. Part II shows that rules are ubiquitous in ethics, since there are no virtues without rules, just as there are no (justified) rules; without virtues. Part Two also shows that rules are as ubiquitous in social phenomena as the causal regularities sought by one school of social science. Part III captures the dialectic of history at least in part by a logical analysis of changes in rules following the onset of quandaries. It then considers how political choices can be both prudent, by keeping within duly considered incremental limits, and yet imaginative enough to escape the recent embarrassments generated by social choice theory. Characteristically versatile in topic and style, Braybrooke offers original light on all theme subjects. One reader has commented, '[His] prose is elegant and always a pleasure to read. Some of the pieces are nothing short of brilliant.' Which did the reader have in mind? Readers may differ (they already have) on just which pieces they would rank highest.